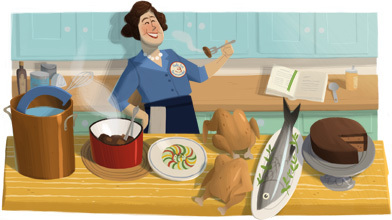 Google has a logo on almost all Google properties today for the legendary American chef and TV personality on many cooking shows Julia Child. It would be here 100th birthday today and Google wanted to pay her tribute with a special Google Doodle. Pretty much anyone growing up in America and probably throughout most countries recognize the face, the food and the name. She has written many cook books but is most well known for her TV cook shows starting back in 1963. So India does not have the Julia Child logo, instead they have this. Julia lived a pretty long life, passing in August 13, 2004 at the age of 91. She was born in California and also died there. For more about her life, see Wikipedia. Forum discussion on the Julia Child logo at Google Web Search Help and India logo at Google+ and Google Web Search Help.